In this post, we’re going to talk about the two official Divi Builder products that are available to you: The Divi Theme and the Divi Builder plugin. We’re going to discuss the differences between the two and then go through the reasons you may choose to use the plugin over the theme. If you’ve been in the Divi community for a while, you’ll know that every so often, the questions “What is the Divi plugin for?” and “If I’m using the theme do I need the plugin?” come up. By the end of this article, you’ll have answers to both. The Divi Theme by Elegant Themes has been a staple of my own web design process since the launch of Divi 2.0 back in 2014. Picking a base theme on which to work my magic used to involve hours of painful investigation into the features and functions of the various options available to me. Divi came along and was user-friendly, feature-rich and versatile enough that for nine projects out of ten, there just wasn’t a need to go through the headache of theme research anymore. Winning. But nine out of ten isn’t ten out of ten, is it? So for that one project every so often, I had to dry my tears and venture back into the world of theme markets or build something custom myself. While perfectly doable, I missed the Divi builder every single time. Which brings us to the first use case for the Divi Builder plugin. Every now and then, you’ll have a project come up that requires unique features. Let’s use the example of a real estate website. Real estate websites will need some kind of property brochure and the ability to filter searches based on meta values such as price, number of bedrooms, property type etc. There are just as many themes adding this type of functionality as there are plugins or other integratable software. In fact, there’s a great one included in your Elegant Themes subscription. 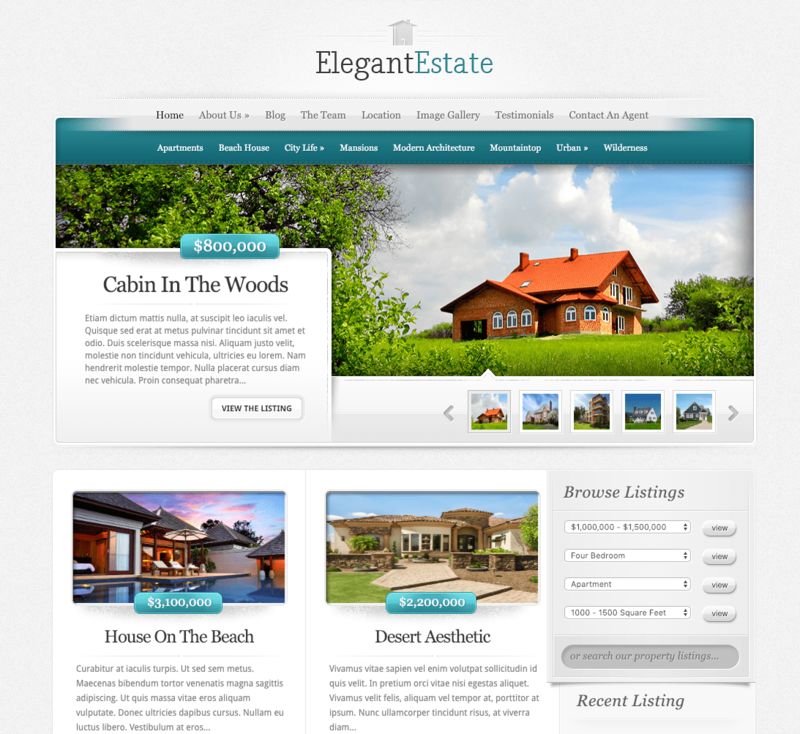 ElegantEstate is one of Elegant Themes’ pre-Divi offerings and comes shipped with an attractive filtering and brochure system. That’s a pretty cool option for anyone looking to get a real estate website online quickly. Prior to the Divi Builder plugin, choosing to use a theme like this meant saying goodbye to the Divi Builder altogether. Now, however, when making decisions on plugins/themes, we have the ability to use Divi for building out the rest of a site pages regardless of the choice we make. This makes the decision an easier one to make: Do you add functionality via a plugin and use the Divi theme, or do you add functionality through the theme and still get Divi goodness via the builder plugin? Two good choices, no wrong answers. Stuck on Divi? Not anymore. The second major reason you may choose to use the Divi Builder plugin is borne from a problem that’s been with Divi and other page builders since day one; software dependency. Many of the most popular page builders work by wrapping your text, images, videos and other assets in shortcodes that output the HTML and CSS that is needed to make them look good. This has zero negative effects on your content, your users or your website until you choose not to use that software anymore and you have to go through and manually remove all shortcodes because without the software that was rendering their output, they no longer work. Bummer. So here’s the scenario, you’ve spent months, maybe years building up the content on your website using Divi, but you’ve made the decision to change themes. Hey, we’re not judging, it happens. You delete the Divi Theme, install your new one and now none of your existing pages are rendering correctly. Prior to the Divi Builder plugin, this was a reality that made a lot of people feel that switching from Divi just wasn’t a viable option. Once you were in, you were in. These days, this problem is no more. Simply install the Divi Builder plugin and your Divi powered posts and pages will look exactly how they did before you switched themes. This means that however your site evolves, wherever it takes you, as long as you’re on WordPress, Divi can continue to power your posts and pages. Everyone gets FOMO (Fear Of Missing Out) every now and again, but rest assured, the Divi Builder plugin isn’t adding functionality beyond what is present in the Divi Theme. Bear in mind that the Theme version is Elegant Themes’ flagship product. Far from being behind the plugin, it is often ahead, if only slightly. If you’re using the theme, there’s absolutely no requirement to have the plugin installed, and if your choice between the two comes down to whichever one is offering the most up to date feature adds, then stick with the theme. It’s also worth remembering that not every feature of the Divi Theme is a feature of the page builder. The customizer options that control the header design, for example, they’re part of the theme, not the builder, so you won’t find them in the Divi Builder plugin. It is also not a huge problem if you’ve chosen a decent theme because they’ll most likely have their own options for controlling the header design. Have you favored the plugin over the theme in any of your projects? Let us know in the comments! May have missed it, but it’s worth mentioning that when using the Divi theme. the plug-in is NOT needed. Often strange problems when using both. I have installed both the Divi theme and the Divi builder years ago and my website is working well. But maybe it is working even better without the Divi builder. Can I deactivate or delete the Divi builder without problems? What a great article Stephen. That question comes up a lot in the conversations I have with designers and clients, not to even mention the conversations I have with myself as I plan the overall design and rollout strategy. The Divi Builder is probably one of the most versatile tools a designer can have in the toolbox to leverage their existing knowledge for future projects (not having to relearn everything). Thanks so much for posting this and look forward to your next article. I’ve created a website with the Divi Theme (with no prior background) and it worked really well. I have an older site with an Applique Theme that I am attempting to add new content to with the Builder but the experience is not as straightforward. For instance, a page I created rolls up on top of the nav bar which looks awful. Also, trying to use modules like the person module, and not be able to add Instagram is simply awful. I really like the builder but I am not convinced it’s the way to go with other themes. Hey Stephen, its worth mentioning also that even thou your not stuck on Divi theme if your using the Divi plugin on a custom or different theme from Divi theme, you are still stuck on the fact that its shortcode driven, so your content in the Divi plugin you create will have to be rendered via the Divi plugin, if you decide to not use the Divi plugin anymore, your in a bit of trouble. You will be left with lots of shortcodes. Which is one massive advantage of something like Beaver Builder that does not do this type of activity. I hope Divi resolve this issue but I much doubt it will as it will require a whole recode. What I would REALLY like, and something I have been asking folks like you to do, is to do a tutorial on using the builder within an existing ET theme. SHOW us what happens. I know that when I moved my original site to Divi, the entire page was one element and I had to cut and paste into new modules. Would that be the same in an ET theme? Please consider and let me know.